PETS AND LAUNDRY PODS | Scoop The Poop! It’s been a great busy year and looking forward to 2015. I want to share an article from a trusted Veterinarian. Laundry detergent pods (single-use laundry packs) have been in the news recently for causing poisonings in children who, attracted by the bright, candylike packaging, ingest them. These pods have surged in popularity recently because they are so easy to use — you just grab a pack that’s about the size of a mini candy bar and pop it in the wash. But if they are a danger for children, what about pets who may eat them? Though pods can seem like potential food items or toys to pets, it’s important to keep in mind that detergents in any kind of packaging are of concern. Laundry detergents contain chemicals called ionic and anionic surfactants. Although small ingestions of these substances, such as a lick of a small spill, generally cause only drooling and/or retching, larger ingestions are problematic (more on that in a minute). One of the reasons pods are dangerous is that the detergent in them is more concentrated than in bottled formulations (although pets generally seem to consume a smaller amount as compared to spills). Detergents also tend not to be handled or regarded with the same caution as other household toxins. Pods, like liquid detergents, are frequently stored unsecured in laundry rooms. Due to their handy packaging, they are also sometimes tossed on top of waiting loads of wash. They are also easy to lose track of if they fall off a counter and slide under an appliance or furniture, where curious pets can later fish them out for play, which may include mouthing the pod. Since the pods are meant to dissolve in water, saliva can lead to a release of the contents even if the pet hasn’t actually bitten through the packaging. Dry pods do not pop easily just by squeezing, but once a pod is wet by water or saliva, the contents can readily ooze out. When comparing single-use products to liquid detergent, there is one obvious difference we have noticed here at ASPCA Animal Poison Control. Though the overall number of calls we receive regarding detergent poisonings has remained the same since these products debuted on the market, there are some interesting differences by species. For instance, dogs are much more likely to ingest single-use packs than cats. Dogs make up about 92 percent of single-use pack cases; they are involved in just under 60 percent of liquid detergent cases. Cats make up 6.5 percent of single-use pack cases and 41 percent of liquid detergent cases. Cats are more likely to knock over open bottles of liquid detergent and get the product all over themselves, ingesting the detergent through grooming. As stated earlier, a lick or two isn’t likely to cause a big problem, but larger ingestions of laundry detergent can cause severe clinical signs. It doesn’t matter for pets if detergent is in liquid form or the concentrated pod form that is now in the news. The most commonly seen clinical sign with detergent ingestion is vomiting. One problem with detergent is that it is foamy; when the animal vomits, the foam can be inhaled into the lungs. In the worst cases, the soap coats the airways and hinders oxygen exchange in the lungs, causing animals to suffocate. More commonly it can cause coughing, difficulty breathing and inflammation of the lung tissues. Gagging and retching are also common, due to irritation in the back of the throat. If an animal does ingest laundry detergent in either pod or liquid form, contact your veterinarian or a poison control hotline immediately. If the ingestion is determined to be minor and there is no vomiting, your veterinarian will likely dose your pet with small amounts of water or milk to dilute the substance. If there is detergent on the hair coat, rinse it off completely with water. Any animal with repetitive vomiting or difficulty breathing should see a veterinarian immediately. 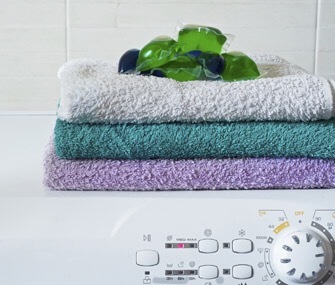 Whether in pod form or liquid, detergents are a sometimes under-recognized household toxin. Remember to keep all laundry products away from pets. Make sure bottle tops are on tight, that the products are stored out of reach of pets, and that pets cannot knock over any containers. One silver lining to the appearance of laundry pods on the market is that they seem to be raising awareness overall among owners about the toxicity of everyday detergents to pets and the need to keep these products secured. ← Can You Believe It’s that Time Of Year? !